Sage 50 Quantum is a multi-functional accounting and business management solution. Manage every aspect of your business � customers, vendors, inventory, jobs, employees, budgets, profits � all in one central system. Need an accounting solution for your manufacturing business? There's an add-on for that! Sage 50 Quantum Manufacturing includes the powerful MISys software to drastically improve your ROI. Sage 50 Accounting software gives you the insights and control you need to make profit boosting decisions. Why are Sage 50 solutions the best accounting software you can buy for your business? VersAccounts is a modern, full function cloud mobile ERP for SMB's who need more than entry level accounting and spreadsheets. VersAccounts was designed to meet the price and functionality needs of companies that have outgrown entry-level accounting. It is comprehensive, easy-to-operate, affordable, fully supported, and accessible anytime, anywhere. VersAccounts offers a modern mobile cloud ERP solution that has the full features of traditional mid-tier ERP offerings at a fraction of the cost. In fact, VersAccounts mobile cloud ERP costs less than most Enterprise or Quantum level accounting solutions. Computerized Business Associates partners with other industry leaders to bring you powerful and affordable business solutions. 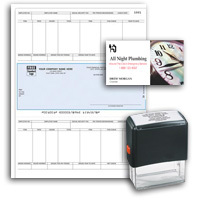 We offer a complete catalog of business checks, forms, banking products, business cards, and more. We work with Visual Vault to give you a complete web based document management solution. Collect Pro works with all versions of Peachtree, Sage 50 and Quickbooks to give you complete, professional invoice management. Other small business products are also available on our Business Products page.